I am sure you loved the cigarette spy camera from my previous post, and many of you now want to find or buy it for your collection. If it turns out to be unavailable, here’s another idea. 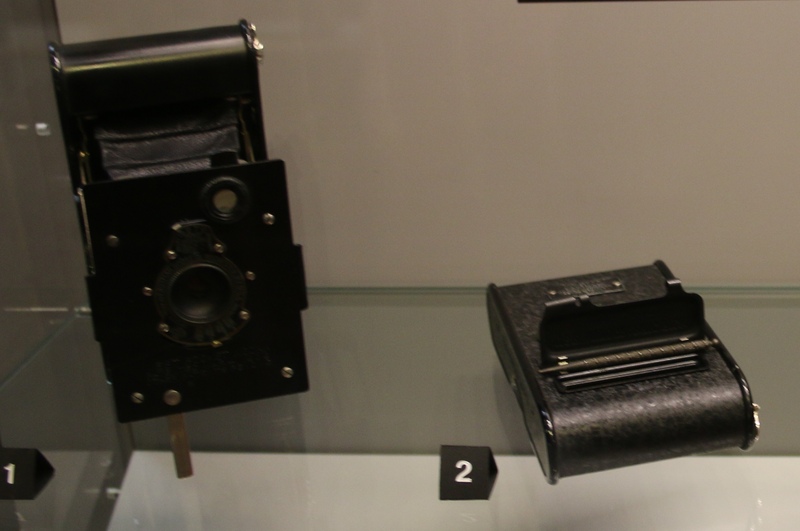 In 1888, this hand-held camera was introduced by a guy from Geneva, who used advantages of the flexible film developed by George Eastman for Kodak. It is a dream item for collectors too, especially those with alcoholic tendencies: I am sure you’ve noticed it is ideal for hiding a bottle. If no such need arises, it can be resold in another fifty years at a profit. This camera is valuable because it didn’t live long: Kodak was fast to reformat the world of photography with its compact offer. This is the right spot to stop and wonder how much the world has changed in a hundred years! I mean, no producer cares a bit about boy scouts anymore. It’s all about the empowerment of women with a zillion shades of pink and gold. If you don’t think that offering a wider range of pink is about female empowerment, I know two things about you. First, you are not in marketing. Second, you have been had by people who are in marketing. For instance, think of the Dove brand that claims to empower women by promoting real natural beauty, but introduces pink bottles to accelerate sales. They know that at the end of the day, when the dust of facebook fights around women’s issues settles down, pink still sells like hell. I am not saying this to start a discussion, but merely to softly land on the planet of marketing, exclusively inhabited by beautiful people and A-list celebrities who can never tell a truth that wouldn’t be a lie at the same time. 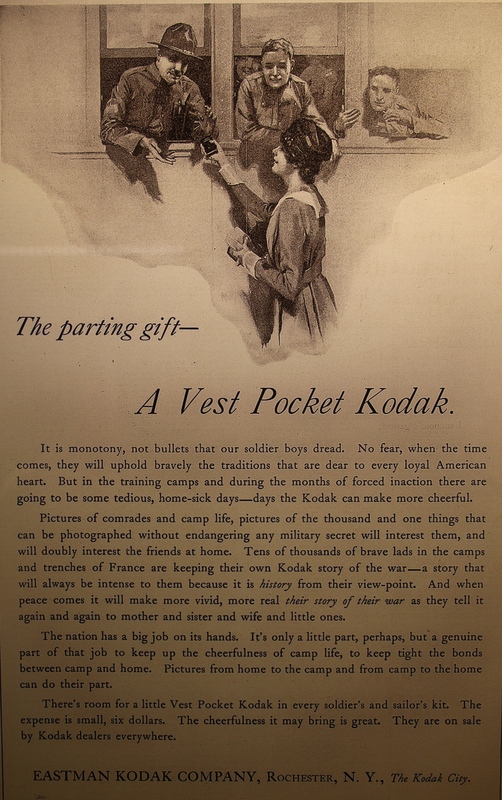 This is a Kodak ad from the Great War. I urge you to read it (it’s clickable). Selling cameras to people who most likely will be dead before they can start using the product under the pretext of fighting trench boredom is very clever, but a tad cynical, don’t you think? Or is it just me? Monotony and not bullets, you say? Taking photos in the trenches, while being gassed by the Germans? Really? But I admit, it reads nice and quite convincing. PS All this wonderful stuff comes from Vevey Museum of Photography. If you are a Nestle employee, make sure you get there (Nestle is headquartered in Vevey). If you are not a Nestle employee and don’t live nearby, I can’t imagine what accident can bring you over to this beautiful spot in Switzerland, except, perhaps, the two first weeks of July when Montreux, a neighbour town, hosts a jazz festival. This entry was posted in Photography and tagged Kodak, Photography on July 31, 2015 by artmoscow. This is not your average pack of John Player Specials. It is a close-up on a photo camera, produced in Kiev, Ukraine (then a republic of the USSR), for the KGB. Despite the KGB had never used this spying tool, it became one of the most sought after collection prizes. If you happen to find one in the attic, don’t smoke it. It can buy you a new house. This entry was posted in Photography and tagged Photo challenge, Photography on July 30, 2015 by artmoscow. Telescopic lens, auto-focus, continuous shooting at 30 frames per second, and – bang! – emotions of the striker who scored a goal can be felt in the minuscule detail of the macro take of sweat beads on his forehead. Close-up shots go as smooth and easy as vodka ones, but without the headache. It has not always been like this, folks. A close-up shot from a long range once required an assistant, preferably under-sized, and hardy both physically and mentally: he had to be prepared for a barrage of abuse if he so much as twitched his shoulder. It’s not ancient history, it is 1948. Imagine reaction of the police if they see it, say, pointed at a government official today. There are photographers who love using historic equipment, but someone with this device is likely to have life-expectancy of a moth, possibly shorter. This photo comes from the Vevey Photography museum in Switzerland. More to follow.